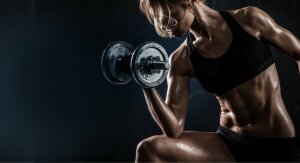 Weights training for women / Should women lift weights? It is still a misconception that females shouldn’t do heavy weights training. That is why the cardio machines in the gym are very popular among women. Instead of spending hours doing cardio every week on those boring machines, why not start doing some weight lifting? Ok, let me rectify. The truth is, weights training does not make you look bulky or overly muscular. Men put on muscles faster and larger than women because of their high testosterone levels produced by male hormones. Average testosterone levels in men are around 200-1000 ng/dL while women is around 15-60 ng/dL. The difference is huge isn’t it? Muscles needs high amount of testosterone to build. And it also needs a lot of time (usually years) and effort to train for it. With such a low level of testosterone level in women, how is it possible to gain big muscles? Its impossible, unless the person is using some external help such as testosterone supplements/boosters or even steroids. Such means are not encouraged unless you have specific reasons or goals to meet. In fact, doing weights (even heavier lifting) will help to tone up a female’s body, giving it a much leaner and fitter look. Just by doing cardiovascular exercises are not enough. Of course you will lose most body fat, but end up looking skinny with the excess skin. You just transformed your body from a “bigger fat” to a “skinny fat”. Instead, doing weights 3-4 times a week will help to sculpt your muscles, giving you a tight and firm body shape. Its time to change our mindset and do more research. Doing weights workout have so much advantages that you won’t believe. 1. Helps women to gain strength without bulking up. Yes, you do get a small increase in muscle mass. That is perfectly normal as its just muscle tone/definition. Girls will achieve stronger upper body hence improving functional strength and quality of life. Women don’t need huge muscle to get the strength they want. Its all about having lean quality muscles with strong neuromuscular activity. 2. Lose body fat quicker. There will be slight weight increase in the beginning because your muscles are absorbing more water and nutrients. You are not gaining fat, don’t worry. The “yo-yo” effect of weight changes are most likely caused by water and carbs. With increased muscles, it helps to raise metabolism rate, turning you into a fat burning machine all day long. The effects can last for hours after the workout. As we know too much cardio work reduces body weight that includes muscle mass. Losing them makes us weaker, affecting our bones and joints in the long run. We need to preserve and maintain our muscles by including anaerobic exercises in your program. Research have shown that intense resistance training burns more calories per day. The after effects of “burning” can lasts up to 12 hours after completing your workout. Why so? These intense gym sessions maximises the EPOC (Excess Post-Exercise Oxygen Consumption) effects. The so called “after burn” effect helps to break down fats during post exercise recovery. 5. Improves posture and boost confidence. Working on your back muscles helps to stabilise your spine and shoulder blades, correcting on the posture. It rectifies hunching problems, rounded shoulders and weak lower back. One will walk with more confidence with an up-right stronger posture. With the surge of endorphins, serotonin and dopamine produced by our body, it helps to reduce stress and enhance your mood. These are “happy hormones” that are naturally being produced during weights training. 7. Reduce risk of getting injured. Injuries are more prone to women having weaker joints and bones. Stronger limbs and core helps to reduce the chances of sports injuries. Women tends to develop Osteoporosis earlier than men as they age. Decrease in estrogen (female hormone) in women as they reach menopause causes bone loss. Moreover, females have smaller bones structure than males. Weights lifting helps to maintain bone density, make it stronger and less susceptible to bone fractures. 9. Reduce risk of diabetes. It maintains blood sugar level and increase insulin sensitivity. Therefore it may delay or prevent the development of type 2 diabetes. Its an effective way to get stronger heart muscles, reducing the risk of any cardiovascular diseases. The heart is able to get a better “pump” of blood around the body. Yes. I am very sure this is the most important benefit of all the above. Its how you feel! I can guarantee that it will make you feel happier, younger, higher self-esteem and sexier in your beach wear. So ladies, forget about the “myths of bulking up” and start hitting the gym. Pump some irons and show the guys how powerful women can be. Feeling strong is empowering!